<h2>SPORTS BRAS</h2>Every woman’s body is different, workout intensity varies between sports and challenges change over time. Whatever your physique and whatever your workout, adidas sports bras have all the support you need - from high impact sports bras and running sports bras for total control, to medium and low impact sports bras designed to give just the right hold.<h5>Achieve your goals in style and comfort with adidas sports bras</h5><p>The range includes:</p><ul class="gl-list"><li><a class="gl-link" href="https://www.adidas.fi/women-high_support-sports_bras-clothing">High Impact Bras</a></li><li><a class="gl-link" href="https://www.adidas.fi/women-medium_support-sports_bras-clothing">Medium Impact Bras</a></li><li><a class="gl-link" href="https://www.adidas.fi/women-light_support-sports_bras-clothing">Low Impact Bras</a></li></ul><h5>Finding the Best Sports Bra</h5>Support where you need it, when you need it most. Finding the best sports bra for you is a matter of matching your bra size to the intensity of your workout, to determine the level of support you need. Generally the larger the bust the more support is required, even for low impact activities. So it’s important to know your adidas bra size. We can help you work this out with the adidas bra finder. Then select a bra that fits the intensity of your sport. 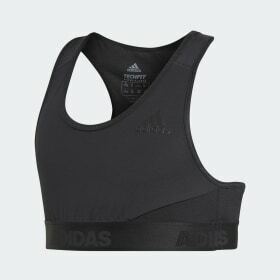 Designed for high to low impact, the adidas sports bras range includes compression sports bras, encapsulation sports bras, crisscross sports bras and tank top sports bras.